Are you a late night goer and looking for the best late-night show? Then Branson Country USA Late Show at Grand Country Music Hall is the perfect show for you to watch. Beautifully located in W 76 Country Blvd. in Branson, this late night show show brings on stage some of the amazing talents along with special guest stars that perform in Branson throughout the year. Branson Country USA features an impressive line-up of musicians, singers, and comedians and it brings an entirely new and different production show. Hosted by Mike Patrick and comedian Jim Dandy, this diverse and variety-filled show provides audiences the perfect complement to your busy day. The show include past stars such as the Oak Ridge Boys, Mickey Gilley, and more. Headliners and popular entertainers from many of Branson’s theatres are frequently included in the line-up – with stars like Paul Harris, Roy Clark, and Clay Cooper all making great appearances in the past in many shows. 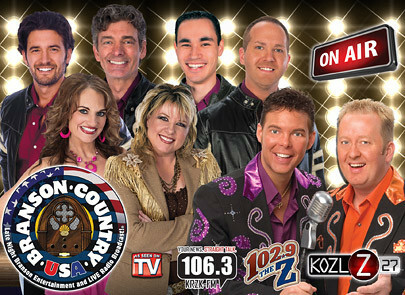 Branson Country USA Show is comprised of many different acts that take part in the show, many of them are firmly rooted in country music. Whether you prefer to listen classic and traditional country music or you like the current hits of today’s superstars and groups – you’re sure to hear it all in this show that is filled with a variety of performances. Led by the Grand Band and New South, Branson Country USA Show includes some of the finest musicians and instrumentalists in the area. Even though the performers rotate each week, the Grand Band is a mainstay of the show. The favorite vocal group New South along with singer Jackie Brown also perform in the show every Friday night and provide a consistent and regular cast for the night. This late night show is broadcast live each week to several radio and television stations that include: KRZK (106.3 FM in Branson, MO); KHBZ (102.9 FM in Harrison, AR); and KOZL-29 (TV station in Springfield, MO). The show is even downloaded on the internet from iTunes. To experience a truly one-of-a-kind show for a late-night of entertainment, stop by for this awesome show at Grand Country Music Hall. Branson Country USA Late Show is a custom-made show for any music fan looking for a fabulous Friday night out. Watch the talented cast of entertainers with incomparable performances – you’re sure to enjoy listening to stunning vocalists, like those good lookin’ lads of New South, lead singer, David Ragan, Jr.; tenor baritone, John Drockleman; popular bass singer, Mark McCauley; and from American Idol tenor, Luke Menard. This show boastfully presents daffy co-hosts Mike Patrick and Jim Dandy, a.k.a. Jamie Haage. Also included in the show are some of Branson favorite performers, as well as other exciting celebrity appearances. This show is the perfect nightlight entertainment for all ages. So, if you are late night goer looking for a perfect show in Branson on Friday night, check out “Branson Country USA Late Show” and you’ll be enjoying a lot of fun.